The New Hampshire Harvest of the Month this month is carrots! Carrots are a root vegetable. 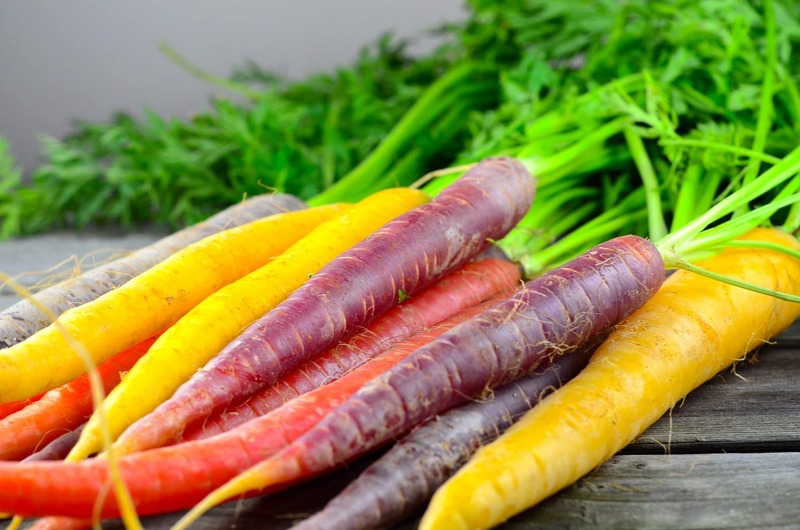 We often think of carrots as orange, but they can also be white, purple, yellow, red or black. The antioxidant beta-carotene gives carrots their bright color. Beta-carotene is a red-orange pigment found in plants and fruits, especially carrots and other colorful vegetables. Beta-carotene is absorbed in the intestine and converted into vitamin A during digestion. Vitamin A promotes good vision, and is important for growth, development, and immune function . Beta-carotene is an antioxidant. An antioxidant is a substance that helps protect the body from harmful molecules which can be found in the environment and naturally through our own body processes. Eventually, these molecules are related to the development of several chronic illnesses. Evidence suggests that eating more antioxidant rich fruits and vegetables, such as carrots, can help reduce the risks of developing cancer and cardiovascular diseases . In New Hampshire, local carrots are grown in the spring and fall, and they can be purchased at local farmers markets and farm stand such as the Farmer’s Market of Keene, Green Wagon Farm and Stonewall Farm. However, they can also be found in supermarkets all year. They can be bought fresh, frozen, canned, or pickled. Carrots are best stored in the refrigerator in a sealed container or bag. If the greens are still attached to the top of the carrot, remove them before storing to prevent the greens from drawing out moisture and nutrients from the carrots themselves. The most commonly eaten part of the plant is the taproot (orange part), although the stems and leaves are eaten as well. Carrots can be eaten raw, steamed, baked, boiled, or cooked in soups and stews. It’s a good thing they are so versatile! From sweet to savory dishes, salads, sauces, cakes and breads to smoothies… the options are just endless! Carrots should be peeled and washed before consuming. Raw or steamed carrots provide the most nutritional value. Cooking the carrots for a prolonged period of time can reduce the vitamin content of the vegetable. As you can see, one cup of chopped carrots provides more than 100 percent of an average adult male or female’s recommended daily allowance (RDA) of vitamin A! 1. Preheat oven to 375 degrees F. Lightly oil a baking sheet or coat with nonstick spray. 2. Place carrots in a single later onto the prepared baking sheet. Add olive oil, balsamic vinegar, garlic and thyme; season with salt and pepper, to taste. Gently toss to combine. 3. Place into oven and bake for 35-40 minutes, or until tender.